Don't give up on it just yet! We’ve all been there. We purchased a cult beauty product because of all the great reviews. We immediately swiped our credit card for a makeup item that looked spectacular when we swatched it on our skin at the mall. Then after using it for the next few days, we realized that the product isn’t as great as we thought. What now? Before crying over your wasted money, try these alternatives. 1. Swap with a friend. What may not suit your skin may work wonders on someone else’s. 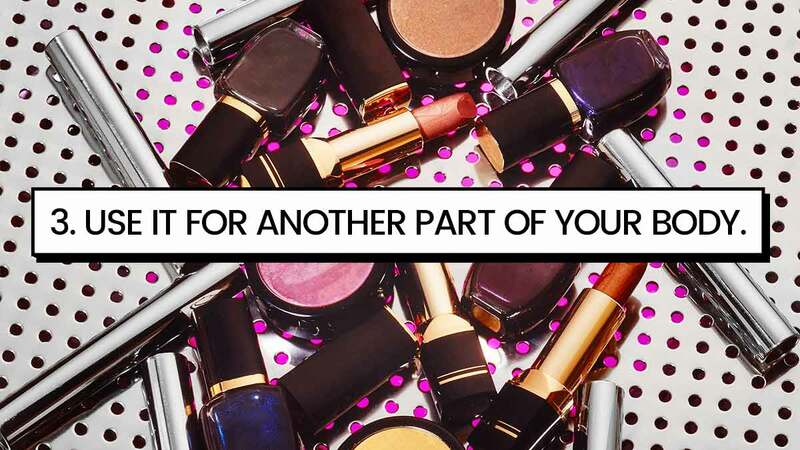 Try swapping your slightly used beauty product with a fellow beauty junkie friend’s reject pile. A word of advice, CGs: When it comes to used beauty products, the only acceptable ones you can give and take are the ones that did not get in direct contact with bodily fluids—like bottled products with pumps. Read our report about used makeup here. 2. Save it for a rainy day. According to WebMD, our skin type can actually change throughout the year depending on the weather, our internal hydration, and our stress levels. If something doesn’t seem to work well with your current skin type and condition, save it for another time. For example, a moisturizer or lotion that is too greasy for your skin right now may work better when the weather is cold and your skin is dry. A foundation that is too dark for you right now may be used after tanning at the beach. 3. Use it for another part of your body. Here’s a secret from beauty and lifestyle bloggers: If it doesn’t work on your face, try it on another part of your body. “I felt bad about the expensive stuff I bought, and felt iffy to give away products I’ve already opened and used,” shared Tara Cabullo of chroniclesofvanity.com. For products that didn’t work on her face, she tried it on other body parts and—voila!—it worked wonders. For example, use your rejected facial moisturizer on other dry spots like elbows and knees. If your whitening day cream doesn’t work well on your face, try it on your underarms, foot, elbows, and knees. Is your face scrub too harsh? Use it as a body scrub instead. 4. Mix it with other products. Is your facial SPF too thick and gunky? Create your own BB cream by mixing it with equal parts foundation and moisturizer before applying on your face. Don’t like the shade of lipstick you bought? Mix it with other lippie shades to create your own customized color. Is your lipstick too glossy or smeary? Mattify it with a dab of loose powder on the lips. 5. Use it as something else. Is your foundation too dark? Use it to contour your face. How about your BB cream that’s too light? Use it as concealer instead. Your face powder that’s too dark can work as a non-shimmery alternative to bronzer. If you didn’t like your hair conditioner, use it as shaving cream. Click here for more tips on what to do with the wrong shade of makeup. 6. Use it for household purposes. If trying it on other body parts still didn’t cut it for you, don’t fret! There may be other purposes for your unwanted beauty products. A foaming facial wash that made you break out may be used as a makeup brush and sponge cleaner. If you hoarded too many complimentary hotel shampoo bottles and realized it’s too strong for your hair, use it as a hand wash or to launder your delicates. Old shampoo may even be used to clean your yoga mat. Don’t like the smell of your hand sanitizer? Use it sparingly to clean gadget surfaces. 7. Display and share with your guests. If you have too many body sprays, liquid soaps, and scented lotions, then display the ones you don’t like in your guest bathroom or kitchen sink for everyone else to use.